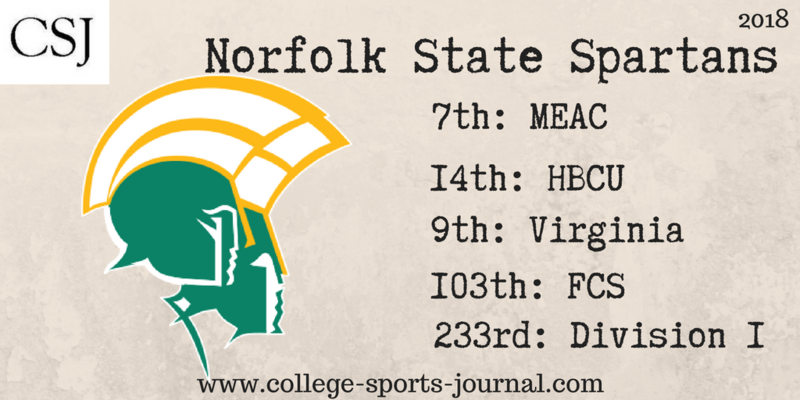 2017 In A Sentence: With more than half of its starters in their first or second career years with the teams, Norfolk State finished 4-4 within the MEAC and were 4-7 overall. Biggest Shoes to Fill: DL Chris Lee was an All-MEAC performer for the third time in his Spartan career, the fifth Spartan defender ever to earn All-MEAC honors three times in a career. He finished the season with 59 tackles and team highs of 11.5 tackles for loss and 5.5 sacks, both of which ranked in the top 11 in the MEAC. Key Player: Senior WR/KR Marcus Taylor the first Spartan in the MEAC era (since 1997) to earn all-conference honors at two positions in the same year. He led the MEAC in all-purpose yards (1,392), kickoff return average (23.8) and kickoff return yards (714), which included a school record-long 100-yard kickoff return TD at James Madison. As a receiver, Taylor tied for the MEAC lead with 60 receptions and was sixth in the conference with 629 receiving yards. He had two 100-yard receiving games, against Hampton (111) and NCCU (132), catching four of his five touchdowns in the two games. Fearless Prediction: With those young starters maturing into this year, the Spartans just may improve on the four-win total this year but the key likely will be the offensive play of its quarterback (Juwan Carter or D’Andre Thomas) and how well it can improve its rushing attack (82.5 yards/game).